I first encountered Brecht’s ideas as an undergraduate theater major at Brigham Young University in Utah. 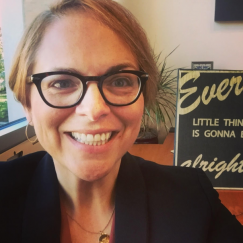 It was 1987, and I was a nineteen-year-old Mormon girl whose primary exposure to the theater had been the religious pageants and roadshows put on by my church. My limited experiences with professional theater production were the highly polished interpretations of Shakespeare performed at a regional equity house, the Utah Shakespeare Festival. Of course, I was also immersed in the 1980s films of John Hughes and others, and I had had some experience with art-house movies, but I had certainly not formulated a personal aesthetic. When I imagined the purposes of theater, film, or any of the arts, I was most compelled by the notion of story. I welcomed the poetic artifice and theatrical means that connected me, as an audience member, to the narrative of a play or film. I had not yet considered the importance of viewing a work of art as a material production that potentially represented the multiple contexts in which it was created. In a directing class, I was assigned to read selections from Brecht’s “A Short Organum for the Theatre.” Brecht had written this work late in his life with the intent of drawing a “description of theatre in the scientific age” (Brecht 1968c, 205). The ideas therein were based on his practical work in the theater. In my reading, I fixed on a sentence in which Brecht writes, “The theatre as we know it shows the structure of society (represented on the stage) as incapable of being influenced by society (in the auditorium)” (189). Contemplating his words, I became aware, for the first time, of the potential dialectic between spectators and the art they observed. I had always loved being entertained by art. In fact, Brecht describes what had been my desired interactions with theater and film at the beginning of “Short Organum”: “[Popular theater] consists of this: in making live representations of reported or invented happenings between live human beings and doing so with a view to entertainment” (Brecht 1968c, 180). I took great pleasure in consuming good art—and to be perfectly honest, even very bad art—for pleasure only. Because of this, I was a devoted consumer of art objects, but I was not a participatory spectator. 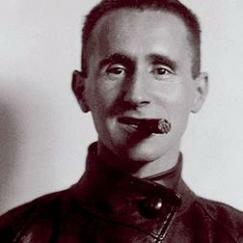 What Brecht describes is a different theory of the theater, one where artifice is replaced with educational structures. In his essay “Theatre for Pleasure or Theatre for Instruction,” he describes an “instructive theatre” in which “oil, inflation, war, social struggles, the family, religion, wheat, the meat market, all became subjects for theatrical representation. . . . As the ‘background’ came to the front of the stage so people’s activity was subject to criticism . . . [t]he theater became an affair for philosophers, but only for such philosophers as wished not just to explain the world but also to change it” (Brecht 1968d, 71–72). Brecht’s notions of the active and influential audience in “A Short Organum” and in “Theatre for Pleasure or Theatre for Instruction” compelled me to consider my responsibility to form a different, more active engagement with art and the world at large. I didn’t fully realize this at the time, but my engagement with Brecht’s theories had set me on a course of study in which I would vigorously begin to consider the social, cultural, and political implications of audience engagement with a work of art.